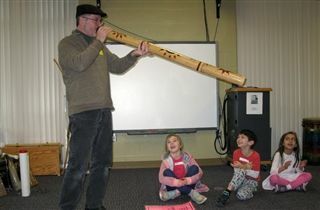 First grade classes welcomed ethnomusicologist and instrument maker Gregory Acker this week as they continued their interdisciplinary study of sound. Mr. Acker will return to assist these young STEAM learners as they create their own musical instruments from recycled materials. This hands-on, STEAM-focused learning project is directed by science teacher Heather Ribblett, music teacher LuAnn Hayes, and visual art teacher Becky Gallion.